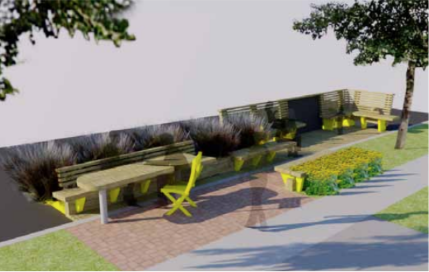 Please join Projects in Place, Mount Pleasant Neighbourhood House (MPNH), and Vancouver Upcycle Design in building Vancouver’s first community-sponsored parklet. A project years in the making, this parklet will utilize old-growth timbers salvaged from the building demolition at Kingsway and Broadway. These materials were gifted from Rize Alliance to MPNH and will find their way back to the neighbourhood, creating a new public space that will animate East Broadway. By building this parklet we will create an outdoor space that can be used by the community to sit and relax, talk to neighbours, as a meeting or gathering place, and ultimately create a place that can build community connections across the boundaries of generations and interests. 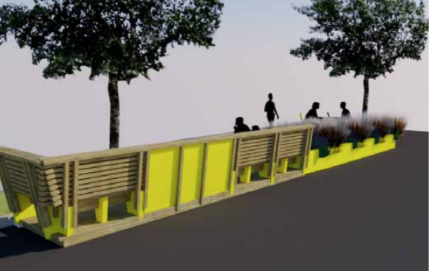 The parklet will be accessible and will connect to the small community garden installed on the green boulevard. With your help on the build, you can be part of the team that creates a more enriching public space. On July 20, we will be receiving deliveries, prepping building materials, and establishing the the parklet foundation. The weekend of July 21-22 will comprise of assembling the reclaimed wood pieces into the parklet design, reconfiguring the boulevard’s garden, and setting pavers. Every day is equally important, so please feel free to sign up for one or many shifts to help us get this parklet built! The site is accessible via bus. Take the Canada Line Skytrain to Broadway City Hall Station and transfer onto either the #9 or #99 Bus. Alternatively, you can take the Expo / Millenium Line to Main Street Science World Station and transfer onto the #8 Bus. Get off near Fraser Street and walk 1 block east. A variety of free street parking is available nearby. All volunteers must be over the age of 18. Everyone is required to sign up beforehand on line, and sign a waiver on the day of the builds. Please note that we will proceed with the builds rain or shine – there will be some protective cover, food and warm drinks on site. Update: The Volunteer Build Form is now closed. Thank you for your interest! To donate, please visit www.mpnh.org/parklet.